Seoul City and the Seoul Tourism Organization took part in Korea MICE Expo 2017 – the Republic of Korea’s representative MICE exhibition – at Songdo Convensia in Incheon from June 14th to the 16th. For this year’s exhibition, 55 member organizations of the Seoul MICE Alliance (hereafter SMA) were also in attendance to engage in joint marketing efforts to bring in more MICE events to Korea. A highlight of the event was the awarding of the ‘Excellent Meeting’ grand prize as voted on by buyers to the Seoul Tourism Organization. The largest total of SMA　member organizations participated in the Joint Publicity Center at this year’s exhibition – a 41% increase from last year with 11 new members – with 55 member organizations taking part. SMA, which launched a public-private partnership in 2010, is comprised of 230 member organizations made up of MICE convention centers, hotels, travel agencies, PCOs, entertainment organizations, unique venues, and more. Covering an area 360㎡, this year’s Joint Publicity Center was 50% larger than the previous year. 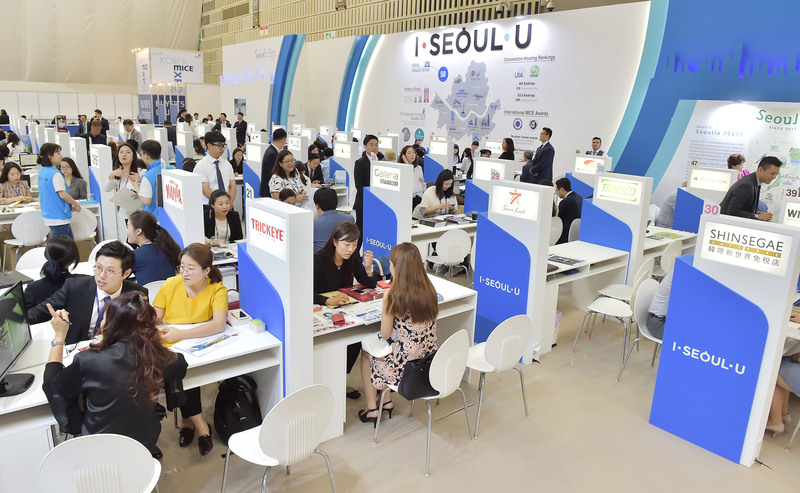 The overall design reflected ‘PLUS SEOUL’, Seoullo 7017, ONE MORE TRIP, Discover Seoul Pass, and more to allow for the simultaneous promotion of MICE Seoul, the tourism industry, and the city’s infrastructure. The various exhibitions planned in cooperation with SMA member organizations and the Event Zone were also big successes. Visitors were captivated by the wax figure of Korean singer Psy from the Grevin Seoul Museum, and virtual reality events hosted by Lotte World and the entertainment group Jump were also available. In addition, there was also a K-beauty experience event featuring I.Seoul.U nail art. Bingsu – a popular Korean snack/dessert made with ice shavings – was also provided during the exhibition, which brought in many visitors. The Seoul Tourism Organization in conjunction with KME 2017 provided support for a media FAM tour and a buyer FAM tour that took place in Seoul. Members of overseas MICE media outlets외 (15 participants from 12 countries) and buyers (65 participants from 21 countries) were introduced to Seoullo 7017, Lottle World Tower’s Seoul Sky (observation deck), the Dongdaemun Design Plaza, and more while efforts were devoted to bringing in MICE events to the city.